Manitoba's wildflower watching season starts each year with our floral emblem, the prairie crocus (Anemone patens) in late April. 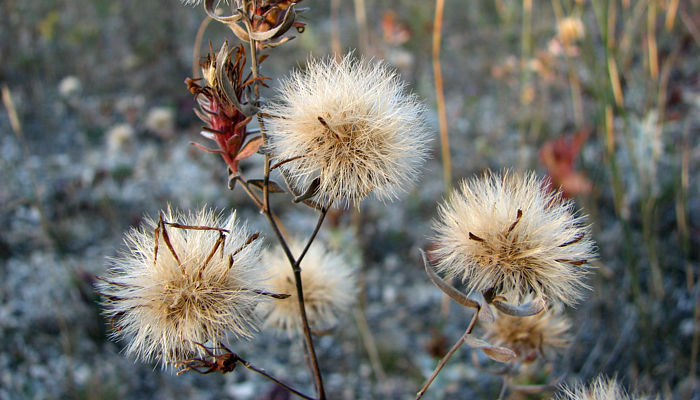 It ends in late September or early October when the last of the wild aster blossoms succumb to the frosty nights. From late August through September, and often well into October, asters dot our landscapes. Wherever you are in Manitoba, asters of one sort or another are the floral harbingers of autumn. We have about 20 species of asters in Manitoba, depending on which source you choose to use and what the taxonomists have been up to lately. (You can see some of Manitoba's Asters on the next page of this article.) Asters of one species or another occur throughout the province and in nearly every type of habitat in our province, from wetlands and prairies to deciduous and coniferous forests. Most asters are small to medium sized plants (20-100 cm high) with leafy stems. They have numerous small flowers (usually <2 cm across) ranging from pure white to dark blue in colour. Taxonomists, people who study and determine the evolutionary relationships of living organisms, are renowned for collectively changing their minds. Revisions to plant and animal names and relationships - taking a species out of one grouping and putting it elsewhere, often renaming it in the process - often results in the numbers of species of this or the other group changing. Asters bloom late in the growing season, providing us with late-season flowers, but, more importantly, providing bees, butterflies and other insects with nectar and pollen as they prepare for winter. Asters flower late, but produce seeds rapidly. Each "flower" will produce a dandelion-like head of fluffy seeds. The seeds are tiny and are spread to the winds before the snow flies. If the seed comes to rest in favourable conditions it will germinate in the following spring. Most asters are good colonizers and will establish quickly in disturbed sites. Beware of establishing some types of asters in a garden setting. Species such as Smooth Aster (S. laeve)and Many-Flowered Aster (S. ericoides) are very aggressive and can take over large sections of your garden. Asters are members of the Asteracea (pronounced: "aster-ai-sea-ai") or aster family of plants, formerly known as the Compositae, those taxonomists at work again! 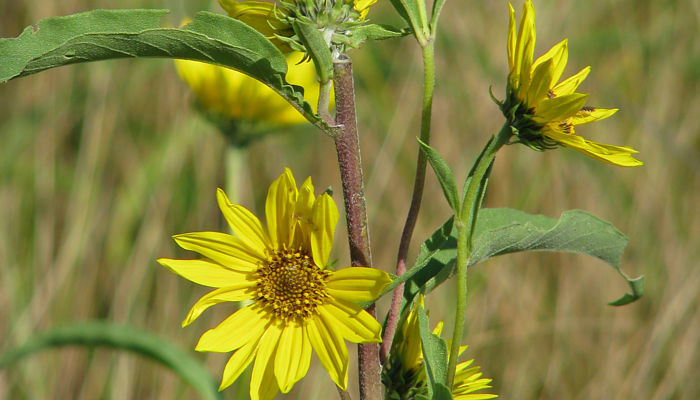 This is one of the largest and most diverse families of plants, including such plants as sunflowers, black-eyed susans, coneflowers, daisies, thistles, dandelions, bur-docks and ragweeds. The main characteristic of the Asteracea is the composite or compound nature of their flowers, or more properly their "inflorescences". An inflorescence is an arrangement of flowers in a cluster. What we would call an individual "flower" on an aster or sunflower is, in fact, a dense cluster of many tiny flowers, called "florets". Look closely at an aster, daisy, sunflower or any other member of the Asteracea and you can see the individual florets. They can be seen clearly in the image of a Rough False Sunflower (Heliopsis helianthoides) above. Most of the florets, that form the centre or disc of the "flower", are tubular in shape and have no petals. Around the edge of the "flower" are florets which have a single petal attached to their outer edge. This array of single-petaled florets encircling the other densely packed florets appears to us to be a single "flower". The whole inflorescence sits in a cup-like structure called an involucre, which is a whorl of bracts (scaly, leaf-like structures) below the "flower". 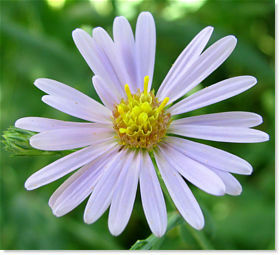 In both Latin and Greek, aster refers to star. Aster plants were named for the stars that they resemble in both shape and numbers, as opposed to sunflowers (Helianthus spp.) which have large, and less numerous, yellow, "sun-like" flowers.